Task 6 has us exploit a loophole in the smart-contracts to recover the decryption key without spending any ether (not including transaction costs). We are given the source for three smart contracts: the Escrow contract, the Ransom contract, and the Registry contract. Let’s first look at the intended method of recovering the decryption key. From the Escrow contract, the victim calls payRansom() to pay the ransom amount. The victim is marked as having paid. The payRansom() function calls requestKey() in the Ransom contract. 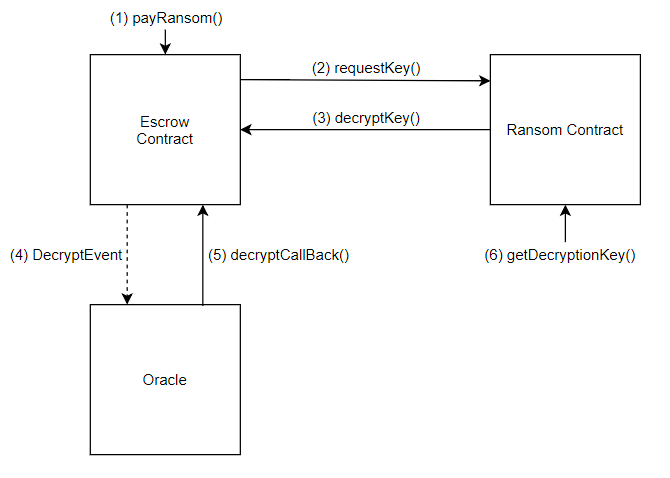 The requestKey() function in the Ransom contract calls decryptKey() in the Escrow contract. The decryptKey() function in the Escrow contract emits a DecryptEvent. An off-chain oracle processes this DecryptEvent, calling decryptCallback(). If the processing is successful, the Ransom contract is marked as fulfilled. Otherwise, the victim gets a refund. The victim can now call getDecryptionKey() to get their decryption key. Let’s look at the entry point for this decryption process: payRansom(). If we want to start this decryption process without paying, we must bypass the msg.value >= vicInfo.ransomAmount condition. Since spoofing msg.value isn’t an option, we can instead try to find a way to modify vicInfo.ransomAmount, setting it to zero. We find that vicInfo.ransomAmount is set when the ransom contract is registered. Unfortunately, we do not the permissions to register our own ransom contract since we are not authenticated. So, the natural question that emerges: how is a contract authenticated? 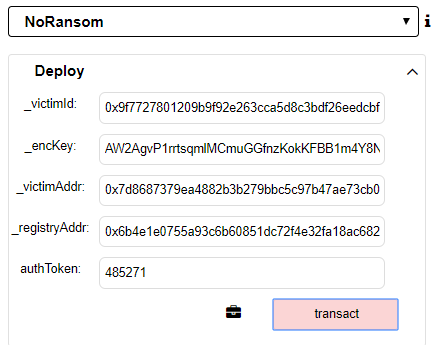 Here is quick overview of the deployment process for ransom contracts. In the constructor of the Ransom contract, the registerVictim() function of the Registry contract is called with two arguments: the victim ID and the authentication token. The registerVictim() function emits an AuthEvent with four arguments: the victim ID, the Ransom contract address, the authentication token, and the person who deployed the Ransom contract. 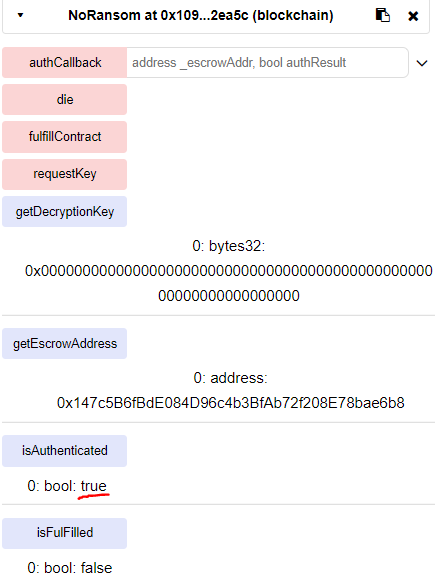 An off-chain oracle processes this AuthEvent, calling authCallback() in the Registry contract. The authCallback() function in the Registry contract calls the authCallback() functions in the Escrow and Ransom contracts. The Escrow contract’s authCallback() function authenticates the Ransom contract’s address if the result is successful. The Ransom contract’s authCallback() function calls the registerRansom() function in the Escrow contract if the result is successful. The key to authenticating a ransom contract is emitting an AuthEvent which the off-chain oracle deems successful. But what constitutes as successful? We can quickly rule out the first two parameters: the victim ID and the Ransom contract address. These two parameters likely have no impact on the return of AuthEvent. The victim ID is just going to be set to our own ID and the new Ransom contract address can’t really be controlled. But of the two remaining degrees of freedom, the use of tx.origin particularly eye-catching. Using tx.origin as a means for checking authorization of ownership is a well known vulnerability. Since the oracle initiates a transaction every time it performs a callback, we can trick the oracle into emitting the AuthEvent for us. Although this is definitely sloppy (potential infinite loop until the gas runs out), re-registering the victim in the callback function allows us to use the oracle’s address as the transaction origin. Unfortunately for us, on further investigation, the tx.origin parameter does not seem to play a part in the authentication process. In fact, if we scan the blockchain for events emitted, we can see the origin address used in the original Ransom contract’s authentication event is something we cannot replicate (without phishing). So, the authentication event depends solely on the authentication code. But how is this authentication code generated? Luckily for us, the one time password (OTP) generation function was leaked in a previously given shared object file (libclient_crypt.so). Reversing this function nets us the following code. Note that the key array is the secret key (found in task 2) base-32 decoded. We can now deploy any Ransom contract we want. The arguments for the Ransom contract constructor (e.g. _encKey, _registryAddr) can be found using the same method shown in task 4. Now, we can make a simple modification in our new Ransom contract—changing the Ransom amount from 100 ether to 0 ether. 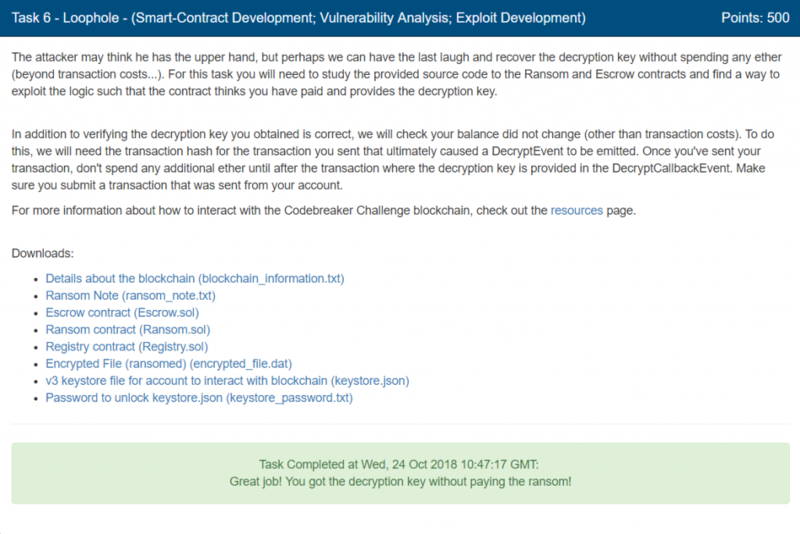 When we call payRansom() with no ether sent and the correct arguments, then call getDecryptionKey(), we receive the decryption key—no payment necessary! By exploiting a weakness in the off-chain contract validation system, we were able to bypass the ransom.